ANDREW Sibley is a charming, gentle man -- but his savagely beautiful art pulls no punches, as he admits. Mostly, Sibley paints universal human situations -- people in love, people being selfish, dancing, fighting and dying -- but every now and then, he feels compelled to deliver a knock-out blow to our current politicians. Thus, when Pauline Hanson first spoke in parliament two years ago -- and not long after Jeff Kennett explained to a startled Melbourne that the reconstruction of the city's Albert Park for a Grand Prix would create a "Feel Good Factor" -- Sibley rushed to his easel. On canvas, the green-eyed pollie metamorphosed into a wickedly beautiful feral cat devouring a national symbol, the kookaburra, in a picture called 'The Feel Good Cat'. The ferocious feline, which features in a large exhibition of Sibley's work presented by Brisbane's Riverhouse Gallery at 11 Stratton Street, is sure to set off a chorus of outraged miaows. But the mild-mannered, 65-year-old artist is unrepentant -- though diplomatically oblique, when asked about his motivation in painting the controversial picture. "Oh, just listening to (Hanson's) maiden speech," Sibley says, "I thought, 'Ooh, this lady could get a following' -- knowing how the human condition is cyclic." Cyclic? What does he mean? "Well, what I'm just saying is, that if you live long enough, with political regimes, things are cyclic: you get fascism and you get economic rationalism," he says. "And listening to her speech, I suddenly thought, there is that wildcard element in her -- and she said things I thought could be appealing to certain groups of people." Nonetheless, as Sibley insists, his primary purpose was not to paint Ms Hanson "in a nasty way" -- but to highlight the dangers unleashed by strong forces, both in politics and nature (Sibley, who lives in the Victorian countryside, is also concerned about the problem of predatory feral cats). While the political scene gives Sibley plenty of food for thought, as his exhibition shows, he continues to find inspiration in people and their relationships. One series in the show, called 'My place', is a celebration of ordinary Australians. Another series, 'Old Saints & New Icons Down Under' -- featuring such individuals as a school-crossing lollipop lady and an Aboriginal Madonna and Child, a mother whose son has died while in detention -- is about honouring those whose suffering, or service to the community, Sibley feels is overdue for recognition. Then there is the 'Feel Good Factor' series of paintings. "It started," Sibley explains, "when Kennett said, 'The Grand Prix may run at a loss -- but think of the 'feel good factor'. So, the paintings are about hedonism -- about people who want to enjoy themselves without consideration for the rest of society." The major 'Feel Good Factor' painting -- which is without doubt, the piece-de-resistance of the show -- is a five-metre long picture called, 'The Beautiful Human Zoo, the Feel Good Factor.' A huge work, it is both uncompromisingly satirical, and a most poised and beautifully judged work. A dreamlike atmosphere is created with lustrous, floating washes of oil paint. In works like this, Sibley says the great challenge is to balance thought-provoking social commentary with art's own "feel good factor" -- its enduring mission to create beauty. "It's very hard," he says of this balancing act. "Matisse said that art need be nothing more than sublime decoration -- however, some artists make commentary on the human condition -- neither is more important than the other. "I like to feel my works have that necessary aesthetic ingredient, that they can be enjoyed in terms of colour, the patterning -- I'd like people to enjoy them -- but just with a quite shudder now and again!" Enjoyment, yes, but he feels strongly that his own mission is to continue in the footprints of the great artists of social commentary: 'I have artists looking over my shoulder," is the way Sibley puts it. "Like Max Beckmann and Goya -- I am a beneficiary of their legacy." And with a career now spanning almost 40 years, Sibley has by now established himself as a major Australian artist, whose work provides an insight into Australia, its trials, hopes and successes. Yet, it has not all been plain sailing, with Sibley enduring a long trough earlier in his career, when his work was ignored by the critics and collectors. 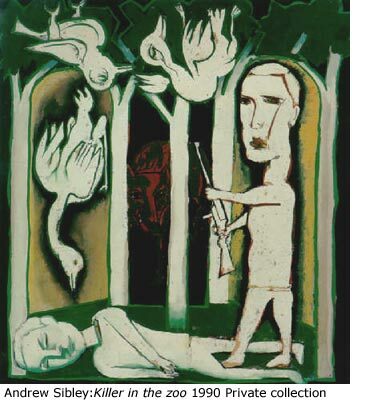 "The secret of an artist's life," observes Sibley philosophically, "is to live long enough, or know exactly when to die -- and I'm not ready for that!" "Robert Sibley: Art on the Fringe of Being" by Sasha Grishin: Book review by Sue Smith. The story of the rise and fall, and rise again, of Australian painter, Andrew Sibley, is the subject of this absorbing book by a leading Australian art historian. Hailed for his intense figurative paintings in the early 1960s, Sibley had sell-out shows in Australia, and was included in a prestigious museum survey, Recent Australian Painting held in London in 1961. But when taste shifted towards more readily pleasing figurative and abstract art, he was dumped a few years later by the art cognoscenti. He quietly kept going -- teaching, and consolidating his art, which became tougher, more confronting and profound, until in the mid-1980s his brand of expressionistic figurative art again became fashionable. The book's selection of works spanning more than five decades shows that Sibley's style and methods have altered over time, but his subjects have never changed; he is obsessed with the human condition -- vulnerable and alienated. He once remarked: "My people are non-idyllic. They are victims of constitutional and environmental factors." Was Sibley himself also a "victim"? Buffeted not so much by fate, as by a fickle, myopic art world? Author Grishin, a Melbourne-trained historian, suggests as much in his text. His tone is measured, but he keeps alive a perennial cultural rivalry between Australia's leading art cities, Melbourne and Sydney, by neatly taking every opportunity to belabour the Sydney critics whom he perceives as having twice wronged Sibley; first in the mid-1960s, and again in the mid-70s.